This is the most significant book I’ve read all year. Pete and I just spent a fabulous week in a lovely cabin in the Black Hills of South Dakota. Our aim was to stop, reflect, relax, and refresh. Some days we played tourist, enjoying the scenic drives, wildlife, and golden aspen and cottonwoods. Other days we hung around the cabin, reading, talking, and praying. After a crazy year that included moving both our home and Pete’s ministry office, it was just what we needed. I had a stack of books to read, and managed to make it through several of them. 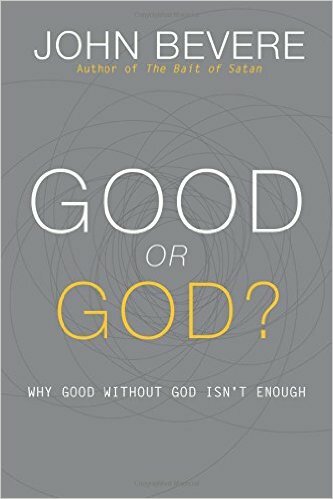 They were all excellent, but if I could pick one to recommend most highly, it would have to be Good or God: Why Good without God Isn’t Enough, by John Bevere. I’ll give you fair warning. All of Bevere’s books are very good and worth reading. He has the gift of exhortation, and always manages to hit his readers right between the eyes. I always end up on my knees after reading one of his books. But even with that track record, Good or God may be the most significant book he’s ever written. It’s clearly God’s message for today’s American church. … The Word of God had exposed and corrected me. My standard of good was apparently different from the divine standard of good. I don’t know about you, but at this point I was desperate to know how to discern good and evil from God’s point of view. The rest of the book is devoted to answering this essential question. Bevere exhorts us to listen to and obey the Holy Spirit. He asks, “Is God really your Lord, or just your Savior?” Have we truly put God in charge of our lives—our beliefs, our opinions, our actions? Is our aim comfort and pleasure, or holiness? And is our submission and obedience motivated by a sense of duty, or by a passionate love for God? I guarantee he will make you squirm. However, I’d rather be corrected than to live my life outside of God’s will. As he draws illustrations from contemporary issues, both in the news and in our churches, Bevere points out the many ways in which we have been deceived into believing lies the world is telling us, instead of going to Scripture to learn what God has to say. This book is a vital challenge to the church to wake up and believe God, not relying on our own understanding, before it’s too late. This entry was posted in Book and tagged Bevere, book, holiness, John, Lordship, review. Bookmark the permalink. ← Will “Life As We Know It” End September 28?